The famous song by Rupert Holmes in 1979, gave the Pina Colada Frozen Concoction worldwide recognition. Now even though this is when most of the world discovered this tropical libation, it was actually invented two centuries earlier by a Puerto Rican pirate by the name of Roberto Cofresi. Cofresi wanted to boost his shipmate’s morale, so he crafted a drink containing rum (pretty much all that pirates drank), mixed with fresh coconut and Pineapple. However he kept this simple recipe a secret and with his death in 1825, the recipe was lost. I decided to do a little research a few years ago while competing in the Pan American Cocktail games in San Juan. A few years prior to that I was in San Juan for a bartending school convention, staying at the El Caribe Hilton, a famous and historic hotel nestled on the beach. 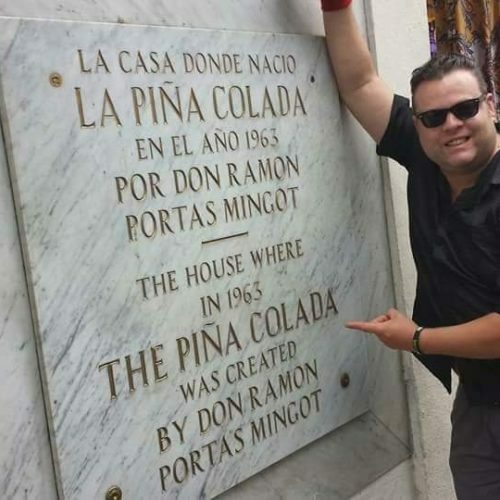 During my stay there, the bartenders informed me that the original Pina Colada recipe was concocted at that very bar back in 1954 by a bartender named Ramon “Monchito” Marrero. However, this cocktail was exactly that-a cocktail with white rum, coconut cream, and pressed and extracted pineapple juice. It was shaken with ice and served as a chilled cocktail in a poco grande glass with no ice. Needless to say, the cocktail was a huge hit. In fact, because it was so popular over the next 24 years, that in 1978 it was proclaimed at Puerto Rico’s National Drink, just in time for Rupert Holmes smash hit to promote it worldwide ironically! But where did Rupert Holmes discover the inspiration for this drink? Actually, and arguably the true birthplace of the Pina Colada we all know and love today, the frozen concoction that gives us glorious brain freezes with a tropical flair, was at the Barrachina Restaurant, invented by Spaniard bartender, Ramon Portas Mingot, also a well know cocktail author at the time. It was here that Don Ramon perfected this cocktail in 1963 by combining fresh pineapple juice, condensed milk, coconut cream, white rum, and ice in a blender, creating the ultimate tropical rum smoothie, proclaiming it as the “PINA COLADA” which means “strained pineapple. By combining the cream of coconut with the citrusy pineapple and toning it all down with condensed milk, this drink was served best by blending its richness with crushed ice to created Puerto Rico’s most famous and refreshing rum smoothie! Regardless of who truly invented the drink, it is celebrated every July 10th on the island of Puerto Rico and is probably the most famous frozen drink in the world next to the frozen Strawberry Daiquiri-a drink invented in Cuba. The Pina Colada….a drink celebrated today, yet consumed 365 days a year all over the world! In the mood to have one now? Feel free to make your own with this recipe we’ve provided! WITH ICE AND THEN TRANSFER THE ICE TO A BLENDER. POUR IN ALL INGREDIENTS SO THAT THE LEVEL OF OF ALL LIQUID IS EVEN WITH THE TOP OF THE ICE IN THE BLENDER. BLEND FOR 20-30 SECONDS AND POUR.